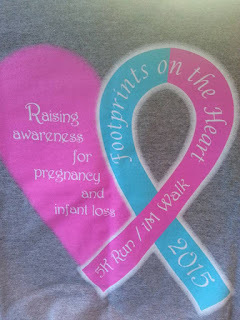 Last Saturday, I ran in another 5K for pregnancy and infant loss awareness (PAIL). The organization that put together this event is called Footprints on the Heart and is located in Euharlee, Georgia. Created in 2012, this organization's "goal is to raise awareness, and education, for pregnancy and infant loss in [the] local community." 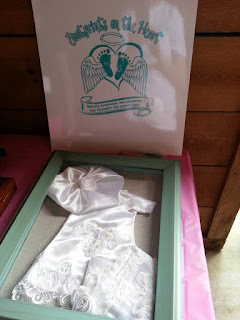 At some point, the ladies who created Footprints on the Heart "hope to create a non-profit organization that offers various services/resources to those who have been affected by pregnancy and infant loss." And I have no doubt they will be successful in their endeavors! 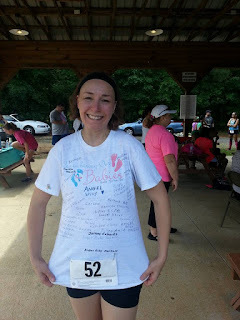 This 5K run and 1M walk event in Euharlee was fantastic! 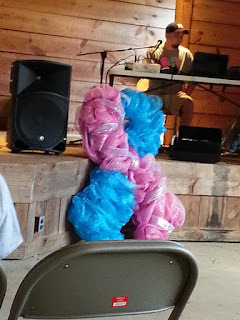 You could tell they really put their hearts and souls into creating an occasion where baby loss moms could come together to remember and to honor their lost children. I was proud to wear my remembrance t-shirt and run for Angel and babies lost too soon at this event. 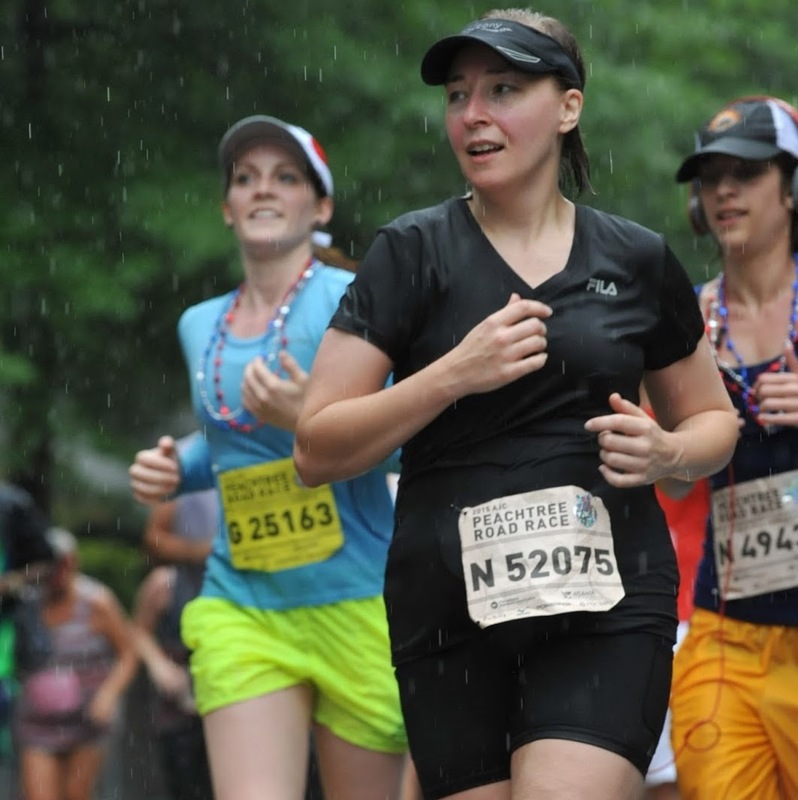 I ran a great race, and I finished at just above 35 minutes. 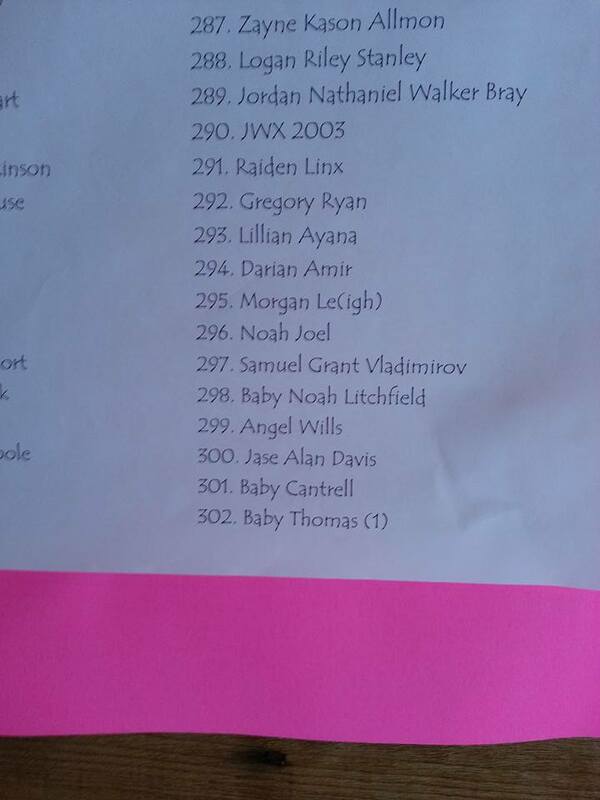 I was fourth in my age group out of nine. Footprints on the Heart is really a great endeavor! One of the things this organization does is create infant gowns for stillborn babies out of donated wedding dresses. I plan on donating my dress at some point! If you can support this organization in any way, shape, or form, let me encourage you to do so! They work tirelessly to spread awareness for PAIL and to create opportunities for us to remember our children. For example, at this recent event, they had a list of over 500 names of those babies lost too soon, and they honored them by reading each and every name aloud before having a balloon release! 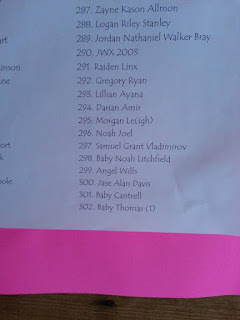 The long list of names is hanging on the wall. For the balloon release, I wrote Angel's name on the balloon, and then the names of those babies whose mommas I somehow know personally, I wrote those on an attached card. 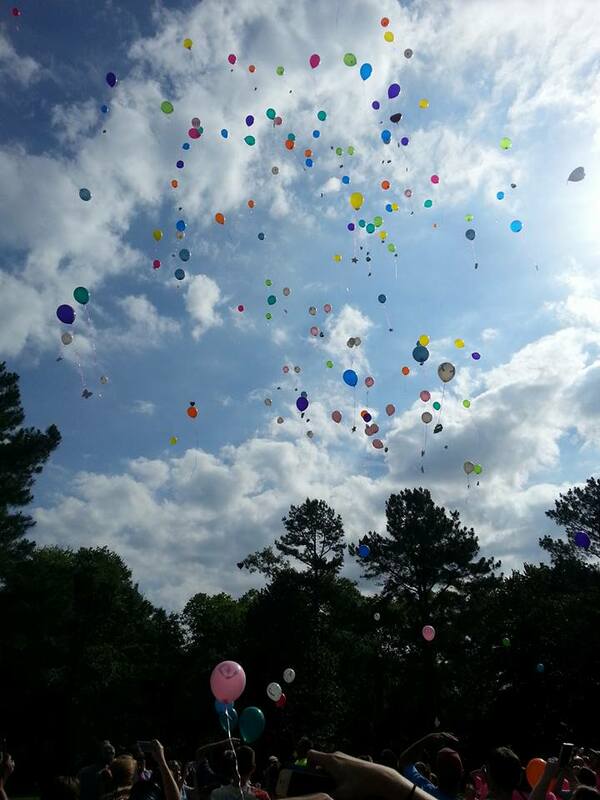 There's just something so emotional about a balloon release to honor those lost to us. 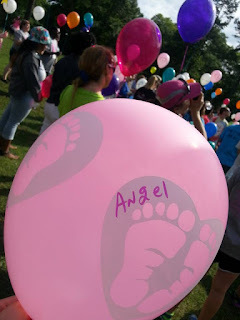 When I let go of Angel's balloon and watched it fly away, a flood of emotions overwhelmed me. I couldn't help but shed tears as I thought of the day she "flew" from me and into the arms of my Heavenly Father. And as I watched her balloon go up amidst the others released that day, I thanked God for the short time I had with her and felt assured I would be with her again one day. A priceless moment I will always treasure in my heart. And behind each of these losses is a hurting mom. A grieving father. 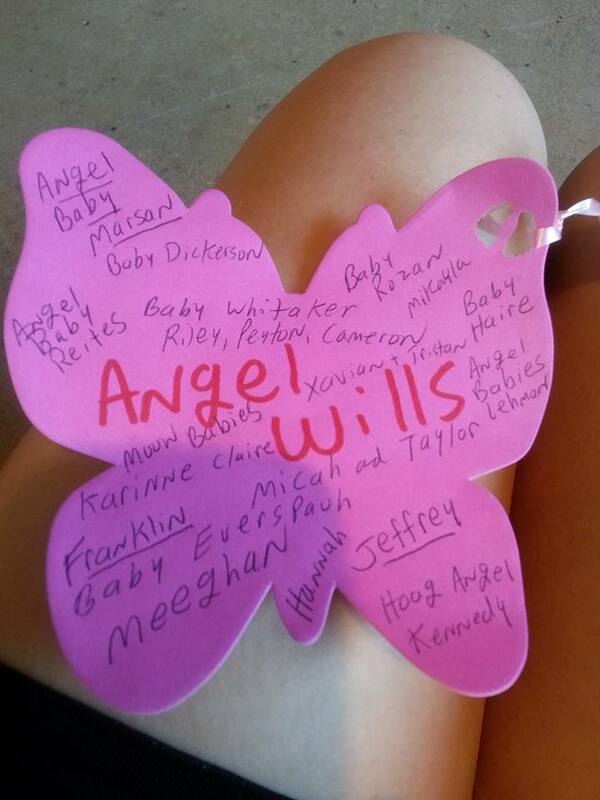 Heartbroken siblings and extended family members. What do you do when someone you know has lost a baby? 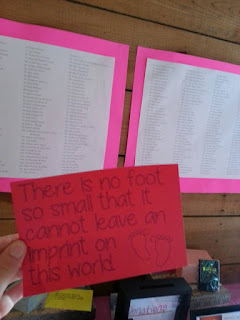 I wrote a post about that not too long ago, but let me encourage you to consider supporting organizations like Footprints on the Heart. They can help answer that question of how to respond when someone you know experiences a loss, and if you are the one who has endured a loss, they can help you grieve and remember that precious baby.